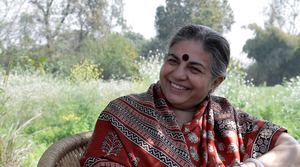 Vandana Shiva: As long as we stay alive, as long as we do not see ourselves as separate, as long as we see ourselves as carried by this amazing force, this amazing intelligence, there is never a moment you can feel powerless because you experience that deep power every moment and that’s where you stop despairing. And in the ??? 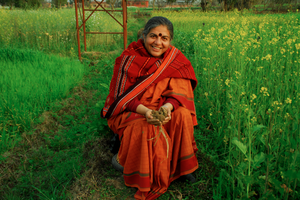 ?, communities have got together to harvest rain as they used to traditionally through ??? and rivers that had died are coming alive. So, we are seeing a realignment with the water cycle and the sanctity of water and it is a power. That realignment unleashes energies, political and spiritual energies, that are, in my view, stronger than the power of capital, irresponsible capital, and we are turning things around. There’s nothing like “the big work” and “the small work”. All work done for keeping life in its fullness and maintaining life in its fullness is The Great Work, as Thomas Berry taught. As a mother, I always say, “Once you’ve changed a babies ‘nappies’, that becomes the measure of the great work.” The ability to be there to change the ‘nappie’ at 3 a.m. in the morning — that is as important as dealing with the World Bank and it’s as important as dealing with the World Trade Organization. Most cultures for most of humanity have lived over long periods of time by adapting to the patterns. We have developed in contemporary times this arrogance that our patterns are superior and that there is no pattern — that it’s all chaos, it’s disorder, it’s just accident — and then imposing the structures of concrete, the structure of fossil fuels, the patterns of pollution on a body of patterns of constant recycling. It is really the challenge of our times. I think real science has to be a spiritual endeavor because real science is understanding deep patterns, understanding lasting process, and understanding how things hang together. Spirituality is the same thing. It is about understanding our place in the universe, it is about connecting to the rest of life, and that connection creates in its very existence a humility of you being just a small part of a very, very large, limitless beast and, while creating humility in you, it also creates responsibility that what you do has impact on a lot, on the full fabric, on the whole web of life. The British Journal of Nutrition published a meta-analysis done by Professor Carlo Leifert of Newcastle University and 15 other scientists from around the world. This research finds significant differences in the nutritional content of organic and non-organic crops (fruit, vegetables, cereals and pulses). Organic crops and crop-based food products were found to have significantly higher concentrations of antioxidants (including phenolic acids, flavanones, stilbenes, flavones, flavonols and anthocyanines) compared with their conventionally produced counterparts. The mean percentage difference for most antioxidant compounds was between plus 18% and 69%. Smaller, but still statistically significant, composition differences were also detected for a number of carotenoids and vitamins. 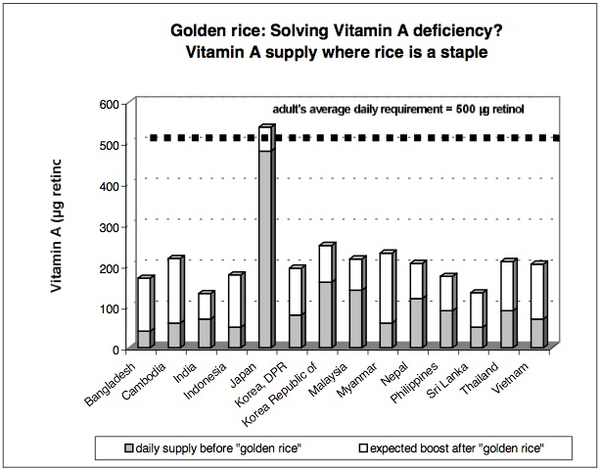 The project leader on the Golden Rice project at the International Rice Research Institute is Dr Gerard Barry, was also involved with some of Monsanto’s ‘golden egg’ patents and the man responsible for the company’s toxic RoundUp resistant products. There is a clear revolving door between corporations and research institutions in which a handful of actors are driving a for-profit corporate venture. Giants including Monsanto and Syngenta sit in the driver’s seat by controlling patents Intellectual Property Rights, while cleverly spinning these initiatives as philanthropy to open up for more & more patented grains, vegetables, fruits, while ensuring systematic erosion of tradition diverse foods & Traditional knowledge about healthier, more nutritional, culturally acceptable, diverse food crops & foods, projecting them as inferior.